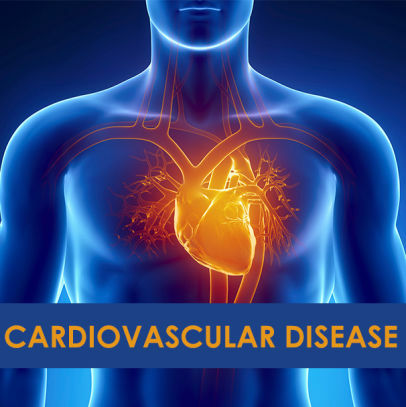 Cardiovascular disease is also known as heart and circulatory disease, and this term covers all diseases that affect the heart and circulatory system. It’s the most common cause of death in the UK and includes coronary heart disease, angina, heart attack and stroke. Coronary heart disease is caused by a gradual build up of fatty deposits on the walls of your coronary arteries. This causes the artery to narrow, and makes it harder for the artery to supply your heart muscle with blood and oxygen. The medical term for this condition is atherosclerosis and the fatty material is known as atheroma. Over time, the artery may become so narrow that it can’t deliver enough blood oxygen to your heart, especially when you’re exerting yourself. This can lead to angina – a pain or discomfort in your chest. A heart attack occurs when a piece of the fatty atheroma breaks away from the artery wall and causes a blood clot to form. If this clot then blocks the artery, your heart muscle will be starved of blood and oxygen. A heart attack is a medical emergency and if you suspect that you or someone else is having one, you must call 999 immediately. Just as the heart is served with blood and oxygen by the coronary artery, your brain is given oxygen and essential nutrients in blood delivered by the arteries in the neck. If the arteries in the neck begin to narrow because of a build up of fatty atheroma, the arteries may find it difficult to supply blood to the brain. Stroke is caused by the blockage of an artery carrying blood to the brain. Damage caused by stroke can affect your bodily functions and mental processes. For more information on stroke, visit the Stroke Association website or call The Stroke Helpline 0303 3033100. Ethnic group – some ethnic groups have a higher risk of heart disease. South Asian people living in the UK have a higher risk that the rest of the UK population. Asking questions about your family history. After your assessment, your GP or practice nurse may give advice to help you make changes to your lifestyle to reduce your risk of heart disease. Making small changes to your lifestyle can reduce your risk of developing cardiovascular disease. Even if you have CVD the following will help to keep your heart healthy and reduce risk of future problems. Eating a healthy, balanced diet and only drinking moderate amounts of alcohol. There is medication available for patients with coronary heart disease that help control your symptoms and reduce the risk of further problems.